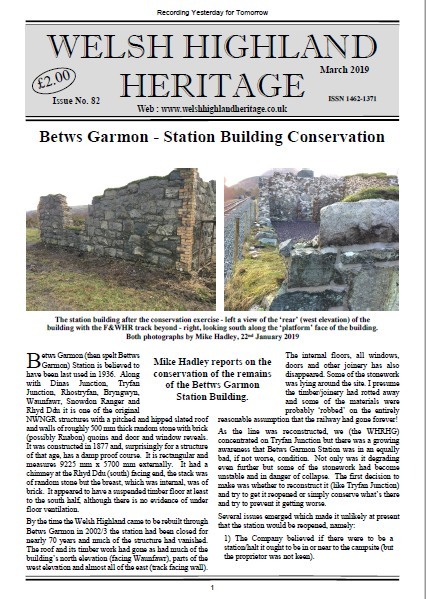 Members receive a free quarterly journal – ‘Welsh Highland Heritage’ – devoted to a wide range of subjects connected with the heritage of the Welsh Highland Railway. Back issues are available either as photocopies or sometimes as originals. They are also available for download by clicking on the image of the issue in question (with the exception of the last eight issues). Index: an index is available, currently covering issues 1-50 and a supplement covering issues 49-60 . The format is A4, early issues were eight pages long, but issues currently contain at least 12 pages, sometimes stretching to sixteen or even twenty pages.